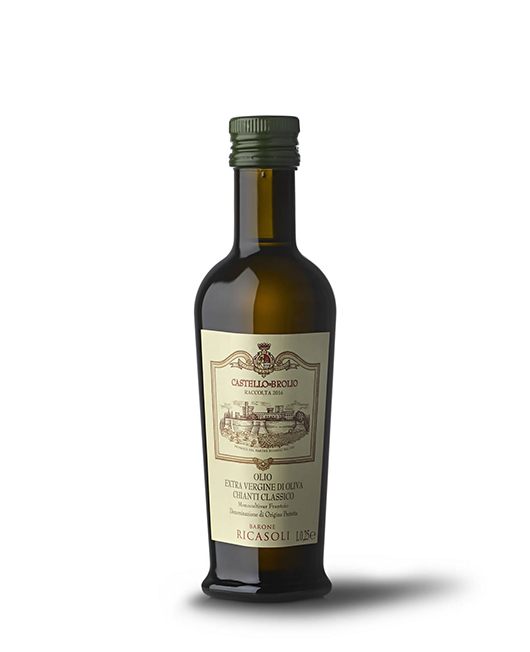 This limited and prestigious production of extra virgin olive oil is dedicated to the variety of olive, Frantoio, that has always been cultivated in the Chianti Classico territory. In a cool place away from direct light in order to preserve the qualities of extra virgin olive oil. After abundant flowering, the summer drought seemed to threaten the quality of the 2017 oil. However, although there were fewer olives, they benefitted from September rains and completed their ripening in perfect health halfway through October. Harvesting began 16 October, and the olives were pressed the same evening. Golden yellow in color with green glints. Marked fragrances of artichoke, green olive, wildflowers. Voluminous in the mouth, balanced between pungent and bitter. In the finish the aromas return. The olives, which are harvested manually, are taken to the press in well-ventilated 20 kg bins and pressed within 24 hours using the continuous method. The olives are washed, then pressed, and the resulting paste is spun at a temperature that never exceeds 27°C. The olive paste never comes in contact with air, because the press works in a controlled nitrogen atmosphere. The oil is extracted by centrifuge, a technique that guarantees the quality of the yield, and very low acidity. When the oil arrives in the storage cellar, it is immediately filtered, and held in 400 litre stainless steel containers until bottling.